Plan Flight provides pilots with a real-time analytics engine for historical data on past flights, current weather and flight circumstances. It provides machine learning that can model human behavior and make recommendations. Pilots gain access to real-time flight information about cancellations and delays. The app brings together multiple internal and external feeds for destination information, crew bids and scheduling – as well as training and certification. 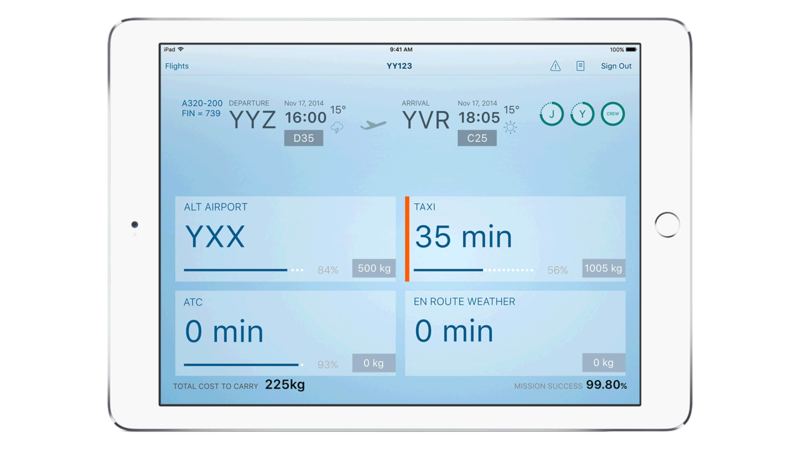 Pilots can log in to their iPad dashboard anytime, anywhere to view flight schedules, number of duty hours worked, certification information – and relevant company news. They can submit maintenance reports and issues immediately – increasing work productivity and team collaboration. Pilots are able to better plan for the discretionary fuel needed for a specific flight to reduce airline costs. They can also better utilize their travel time by taking action on training and certification, as well as bidding and accepting flight assignments.